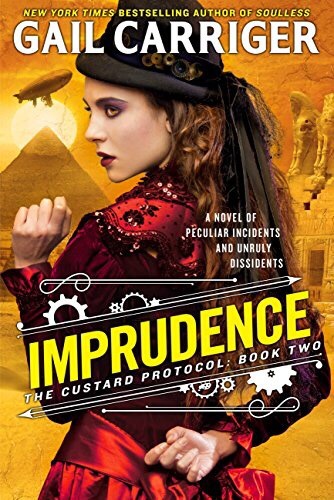 Imprudence continues the adventures started in Prudence with Rue and her friends in their dirigible The Spotted Custard. I have been a fan of all of Gail Carriger’s series, and one of the things I love the most is how her characters from each series are tied to each other. Rue is the daughter of Alexia Tarabotti and her werewolf husband Connoll. In an unexpectedly serious note, in a truly hilarious book, Rue realizes the mortality of her parents. A fact that has her growing up more quickly than expected, dealing with a solution to the problem of what to do with her father who can no longer rule his pack. That seriousness aside, this book is a fun, energetic frolic filled with fripperies and frills. One of the fun side plots-Rue, now 21, and in her majority, has decided to learn “French” from her suitor Quesnel Lafoux (pronounced Con-nel). A charming flirt who seems to have deeper feelings for her than she gives him credit for. I think Rue, with the exception of her best friend Primrose, has trouble viewing anyone seriously because she doesn’t view herself very seriously. Life has been a bit of a lark for Rue, and only the combination of her parents departure from England and Quesnel getting seriously hurt that she allows herself deeper feelings, creating a more well rounded character, although still jolly good fun. As the book ended I couldn’t tell if there would be another book in the Custard Protocol series. The plot seemed to wrap up most of the characters sub plots, with the exception of Primrose and Tasherit, (a possible lesbian love story?). I hope Gail Carriger does write another novel in this series because these books are a joy to read. As colorful as a red spotted dirigible flying into a golden sunset.